Conor Swail and Martha Louise. Wellington, FL – February 27, 2016 – The eighth week of The Ridge at Wellington Turf Tour saw over 30 horse and rider combinations tackle Nick Granat’s technical track, but Conor Swail and Martha Louise were the ones to beat from the get go. Irish rider, Swail, rode his veteran mount to the top of the leader board as only the sixth exhibitor of the day, breaking the beam in 38.731 seconds. Beth Underhill and Viggo nearly caught Swail later in the day, but one-tenth of a second would separate the top two finishers today. Although the sky was grey with clouds threatening downpour, the International Polo Club Palm Beach stayed dry and offered the ideal footing for the $15,000 1.40m Grand Prix. Jeffery Welles and KM Whatever RV were the first pair of the day to ride to a double clear effort. They set the standard high with a time of 40.641 seconds, but with nearly 25 competitors hot on their heels, the day would close out with Welles in third place. Nick Granat’s course proved more technical and built bigger than the past years, which Welles looked upon in favor. Granat utilized a tricky triple combination to catch many of the riders off guard. The line required a forward five strides to the triple, but the verticals came up quickly, requiring patience on both the rider and the horse’s parts. Swail followed only two horses behind Welles with Martha Louise, shattering the previously set time with a double clear effort in 38.731 seconds. He was able to make tight rollbacks and eat up the ground to set the day’s unbeatable time. It was Beth Underhill who almost unseated Swail from the first place position, but one-tenth of a second would separate the two today. Underhill rode Viggo to the time of 38.835 seconds to fall just shy of Swail’s pace and finish the competition in second. Chicago’s Lisa Goldman and Aslan rode to the fourth place position behind Welles, finishing the track just off his time in 40.712 seconds. Catherine Pasamore was awarded the fifth place finish for her time of 40.864 with Z Canta, while Ansgar Holtgers and Wisconsin rounded out the top six. While the 1.40m Grand Prix was taking place down the polo field, Ring 2 was alive with action with the Low and Medium Schooling Jumpers and the much sought-after $2,000 Child/Adult Jumper Classic and the $3,000 Junior/Amateur-Owner Classic. It was Adam Prudent who kicked off the day in Ring 2, riding to the first Medium Schooling Jumper victory with Sir Lochinvar. Christian Currey rode Vigaro to a first-place finish in the $2,000 M&S/NAL WIHS Child/Adult Jumper Classic. 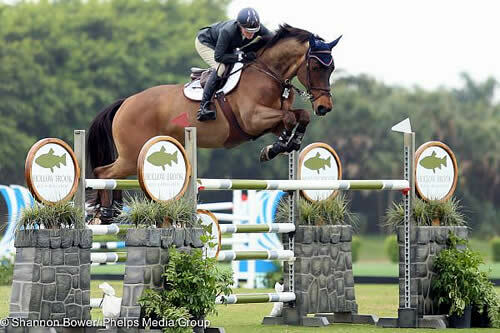 Elizabeth Maloney had quite a successful day, topping the second Medium Schooling Jumper class as the owner of Bigua and winning the $3,000 NAL Junior/Amateur-Owner Classic with Quadrifolio, affectionately known around the barn as Q. Week nine of the Ridge at Wellington’s Turf Tour will take place at Tonkawa Farms, 4150 South Road in Wellington, FL 33414. From Pierson or Lake Worth Rd, go west to South Shore Blvd. Make a left (south) onward to 50th Street. Make a right and the property will be on the right side. The Ridge would like to thank Dover Saddlery for their support of the 12-week series as the cooler and banner sponsor, and they would also like to announce their most recent jump sponsor, Panthera, the leaders in wild cat conservation. Panthera joins Hollow Brook Wealth Management and PJ Saddles as the series’ jump sponsors.